If you are a British national living in the UK (or anywhere else in the world) and have found the man or woman of your dreams who is not a UK citizen, then you can apply for them to join you in the UK. You would be required to apply for a spouse visa to enable them to join you in the UK. 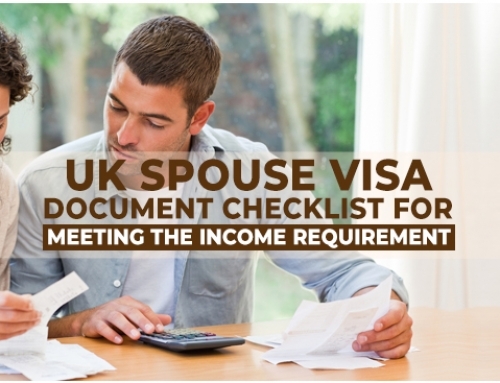 So ‘how do I apply for a UK spouse visa’ is a common question. If you thought it would be a simple enough process, you may want to think again. UK spouse visa is for foreign spouses of UK citizens to join the main applicant (also called as sponsor in the UK). If your spouse is a EU/EEA national, then they would not need to apply for a spouse visa (yet). This is mainly for foreign spouses who are from outside the EU/EEA. To apply for UK spouse visa, your partner will be required to complete an online application and submit in their ‘Home country’. Generally, you cannot switch to a spouse visa if you are in the UK on a visit visa. If you have children, then a separate form will need to be filled for each child. Every time a case worker is evaluating an application they will look for the following factors. Please note that this is merely an indicative list. The financial requirement is usually evidenced by earned income or through a combination of income from employment, self-employment, savings, pension etc. If you are unsure of how you meet the financial requirement it is a good idea to speak to a qualified and experienced Immigration Law Firm. Disability Living Allowance, Severe Disablement Allowance, Industrial Injuries Disablement Benefit, Attendance Allowance, Personal Independence Payment, Armed Forces Independence Payment or Guaranteed Income Payment under the Armed Forces Compensation Scheme, Constant Attendance Allowance, Mobility Supplement or War Disablement Pension under the War Pensions Scheme, bereavement benefits. Would not be required to meet the financial requirements specified above, however a different calculation would apply. The UK citizen and their foreign national spouse must be over 18 and your relationship must be genuine and that you intend to live together as a family in the UK. When submitting the application to UK Visas and Immigration (UKVI), they will wish to see evidence that the marriage or civil partnership is legal and that the relationship is one that exists and is not a ‘sham marriage’. The UK citizen needs to show that there will be adequate accommodation for their spouse and children if granted UK spouse visa. The foreign spouse of UK citizen will need to show that they have a knowledge of the English Language when they apply for uk spouse visa. However, if the spouse is a national of majority English language, their language skills will be implied. Nationals on this list include citizens of Antigua and Barbuda, Australia, the Bahamas, Barbados, Belize, Canada, Dominica, Grenada, Guyana, Jamaica, New Zealand, St Kitts and Nevis, St Lucia, St Vincent and the Grenadines, Trinidad and Tobago, US. As an alternate the spouse will require a valid test certificate from an approved test centre that they have taken UKVI Life Skills (CEFR Level A1) or they have an academic qualification that was taught or researched in English and has been recognised by UK NARIC. Exemptions apply if the partner is aged 65 years of age and older or has long term physical and mental condition. As part of the immigration process, your partner may need to provide evidence of Tuberculosis (TB) screening if they are a resident of a particular country. Applications need to be submitted in person at the relevant Visa application centres. Normally processing times can vary depending on the case load at the relevant Post, however the guidance states that it can take up to 12 weeks. As of 2016/2017, application fees are about £1,195. And applicants need to pay Immigration Health Surcharge towards the NHS of £200 per year. Given the high visa fees and the longer processing times, at Smart Move 2UK we offer a ‘no win no fee’ service as well as a regular representation fee for all uk spouse visa applications. Contact +91 98191 27002 or email us at info@smartmove2uk.com to know more. If the application is successful, the applicants are endorsed an Entry Clearance of 1 month to enter the UK and collect their Biometric residence permits. The duration of the visas is 33 months and can be extended for a further 2 years and 6 months from within the UK itself. Spouse visa holders can take up employment, study, start a business without any restrictions. They can apply for indefinite leave to remain in the UK or settlement once they have resided in the UK for 5 years continuously. At SmartMove2UK our immigration solicitors have helped hundreds of applicants to apply for spouse visa to UK. You can contact us if you are seeking legal help from UK visa consultants in relation to UK spouse visa.